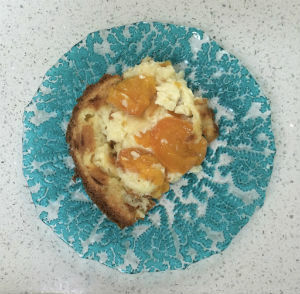 1 – 1 & 1/2 Litre Ovenproof dish 3–4cm deep 8 small ripe Apricots halved & stoned (or a tin if not in season) 4 Tablsp. Amaretto (omit if you don’t drink) ½ Vanilla Pod 150ml Whole Milk 100ml Double Cream 4 Med/Lge Eggs 130gm Caster Sugar 20gm Plain Flour Salt (a pinch) 10gm Butter (to grease dish) Heat oven to 180c, Fan 160c, Gas 4 Place Apricots cut side down in bowl, sprinkle Amaretto over. Split Vanilla Pod in half lengthwise, put in small saucepan with Milk & Cream. Bring to scalding point, remove from heat, set aside to infuse for at least 10 mins. 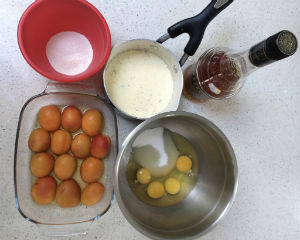 Put Eggs & Sugar in medium bowl, whisk until light & creamy. Add Flour & Salt, whisk again until smooth. Remove Vanilla Pod from milk, scrape seeds into milk. Strain milk into egg mixture, whisk well. Use Butter to grease dish, sprinkle with Caster Sugar. Put Apricots into dish having strained off Amaretto. Pour batter over fruit. Cook in middle of oven for 50/60 mins. Should rise slightly & brown around edges, be slightly set in middle but not liquid. Sprinkle with Caster Sugar. Serve with Clotted Cream. 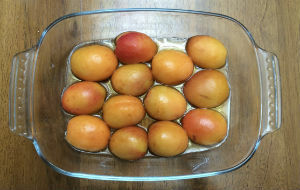 Place Apricots cut side down in bowl, sprinkle Amaretto over. Split Vanilla Pod in half lengthwise, put in small saucepan with Milk & Cream. Bring to scalding point, remove from heat, set aside to infuse for at least 10 mins. Put Eggs & Sugar in medium bowl, whisk until light & creamy. Add Flour & Salt, whisk again until smooth. Remove Vanilla Pod from milk, scrape seeds into milk. Strain milk into egg mixture, whisk well. Use Butter to grease dish, sprinkle with Caster Sugar. Put Apricots into dish having strained off Amaretto. Cook in middle of oven for 50/60 mins. Should rise slightly & brown around edges, be slightly set in middle but not liquid. Sprinkle with Caster Sugar. Serve with Clotted Cream.